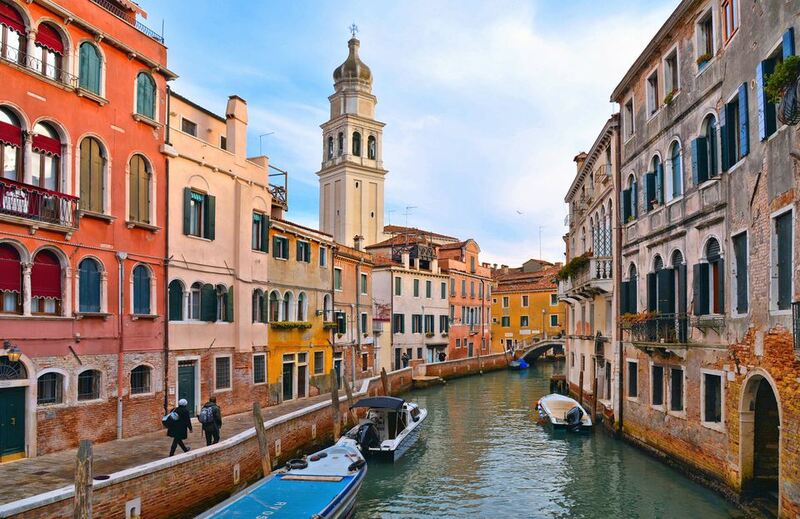 Venice tops the list of Italy's most romantic places and if you're going to Venice for romance, you'll want to celebrate with a kiss in one of these spots. 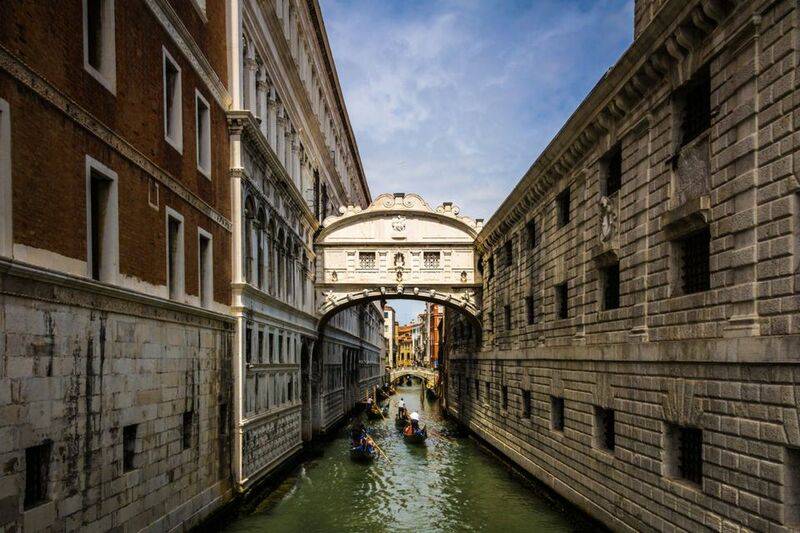 Venice's famous Bridge of Sighs was made popular as a place to kiss in the movie, A Little Romance. In the movie, an American girl and French boy fall in love and go to Venice. In a touching scene, they declare their love with a kiss on a gondola ride beneath the Bridge of Sighs. A gondola ride under the Bridge of Sighs is still one of the most popular places to kiss in Venice but if want something less crowded, keep reading for our suggestions for other great places to kiss. Taking a gondola ride in Venice can be very romantic, but if your route takes you only along the crowded Grand Canal, you may see some of Venice's top sights but you won't find many places for romance. Instead, start at a station away from Saint Mark's Square and tell the gondolier that you want to enjoy a quiet ride on the back canals away from the tourist sights. San Polo neighborhood makes a good choice for a more private ride. Book a gondola ride through Select Italy and choose the Hidden Venice Gondola Ride that starts with a look at the Rialto Bridge but then takes you to a quieter side canal. Tips: Gondola rides at night can be very romantic but they cost more. Gondola rides can be booked with or without music so if you want the gondolier to sing, ask before you book. I asked JoAnn Locktov, of Bella Figura Publications and publisher of the beautiful book Dream of Venice, where she recommends going for a private kiss in Venice. "Wander into a sotoportego, especially if you are shy and would prefer your kiss to be witnessed only by the ancient musty stone," Locktov said. "A sotoportego is a Venetian tunnel of love. The sun never penetrates, it will protect you from the fierce Bora winds, it will shield you from a drenching rain, and it will keep your secrets safe." For a kiss with a breath-taking view, head to the top of the bell tower where you'll have the city of Venice and the lagoon spread out before you. You don't have to worry about being out of breath after the climb to the top because there's an elevator. If you don't mind climbing up the steps, another good view spot is top of the clock tower. Take a Clock Tower guided tour for an in-depth look at the clock and its history. Or go across the Grand Canal to the Palladian Church of San Giorgio Maggiore, where you can get a great view of Venice from its campanile, looking out over the romantic Venetian lagoon—recommended by Orna O'Reilly Traveling Italy. If you're an early riser, the best time for a romantic visit to Saint Mark's Square is around sunrise, before the day tourists arrive. You're likely to have the square almost to yourselves and it will be easy to find a place to kiss with a stunning background. If you're looking for something more social, head to Saint Mark's Square on New Year's Eve for the ultimate group kiss when Venice rings out the year with a huge group kiss in the square at the stroke of midnight. After the kiss, enjoy a bellini or prosecco toast and the fireworks over the lagoon.